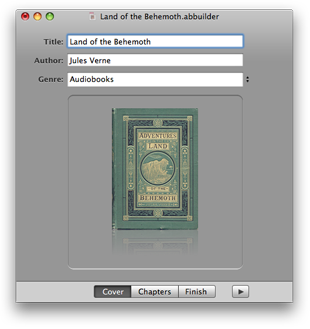 Audiobook Builder for Mac lets you take a bunch of audio files and repackage them as a proper audiobook with all the bells-and-whistles you want for your iPod. I buy most of my music on CD. I get a permanent, non-copy-protected version that I can store away. I haven't actually listened to a CD directly in years. I "rip" the CD into iTune or onto my Linux-based media center and listen there. I've wanted to get into audiobooks for the iPod, but they are ridiculously expensive ($40+). I can find a lot of good audiobook CDs on eBay or Craig's List for under $10. Unfortunately, audiobook CDs usually have one chapter per track. Or worse, just arbitrary tracks breaks. Trying to play these with the iPod is a hassle: You have to note which file was playing when you take a break, and there's a ton of files that need to get transferred around. Audiobook Builder for MacOS fixes all that. You can rip the CD directly in the program (which I haven't tried yet), or you can take all those tracks you've already ripped and make them into a regular audiobook file. You can drag-and-drop cover art and organize the chapters. It even puts the finished product directly in your iTunes library - ready to roll. The single user license is only $9.95. I'll save three times that the first time I rip a "previously owned" CD.